Television chef Guy Fieri volunteers to cook barbecue for evacuees and firefighters battling the North Bay blazes in California. Out among the barbecue smokers behind a shelter in Santa Rosa for fire-displaced residents, television chef Guy Fieri has been helping to serve up chicken, pulled pork and sides to evacuees and firefighters battling the blazes in California's North Bay. 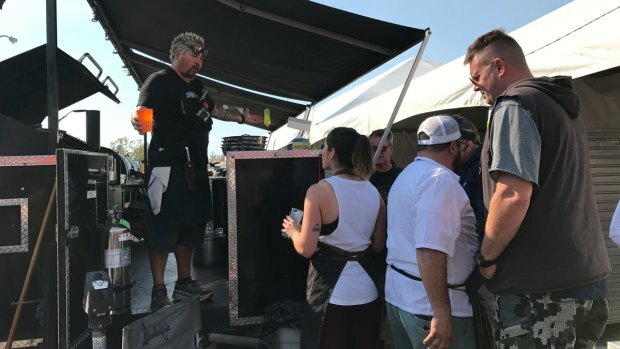 "With these fires, and the evacuations and with all the people that have lost their homes, we're feeding over 5,000 people a day," Fieri said between lunch and dinner in the parking lot of the Veterans Memorial Auditorium on Sunday. "Anybody who needs food at this time in this area." He and other local chefs are working with Operation BBQ Relief, a non-profit that was formed in 2011 after the tornado in Joplin, Missouri. By the end of Sunday, they will have served 23,000 meals, some being sent directly to firefighters on the front lines. Fieri, who lives in Santa Rosa and had to evacuate from his house, has been cooking there since Thursday morning with a mix of volunteers from Operation BBQ Relief and others from nearby. "You've got some amazing chefs from the area," he said. "You've got an insurance agent, you've got a car mechanic, you've got a lumber salesman, restaurant managers, and the kids, people from all over." 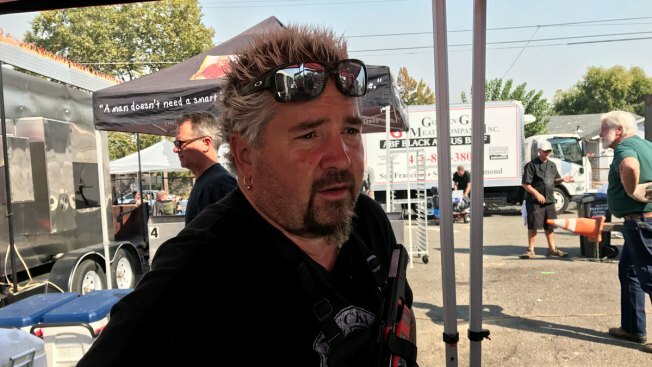 Guy Fieri volunteers with other chefs to feed evacuees and firefighters in California. Over the last week, the chefs have prepared meals of pork loin, mushroom gravy, a pineapple apple teriyaki sauce, braised cabbage with apple, onion and brussels sprouts, mashed potatoes and baked beans. "It's good to see everybody come together," said Nathan Trivers, an owner of the Up and Under Pub and Grill in Point Richmond. 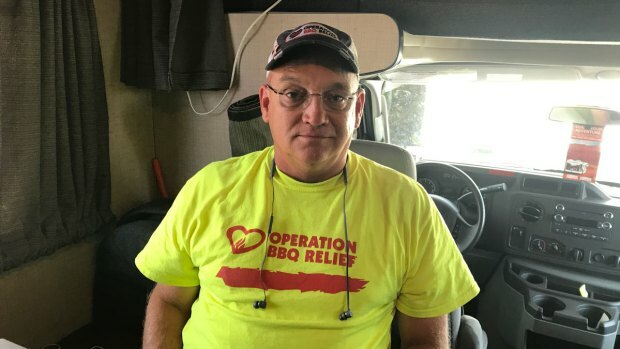 Operation BBQ Relief has been to 23 states and 44 disasters. Its volunteers have cooked nearly 1.7 meals, but this is their first visit to California, said Dewayne Daniels, a director in field operations. "The community has absolutely opened up their arms to us," Daniels said. Fieri's house was spared, but it is close to the Coffey Park neighborhood that was destroyed. "Just terrible," he said. "Just devastating. Never seen anything like it in my life. But the only good thing we can say out of this is the resiliency. And the community outpouring of support is amazing."